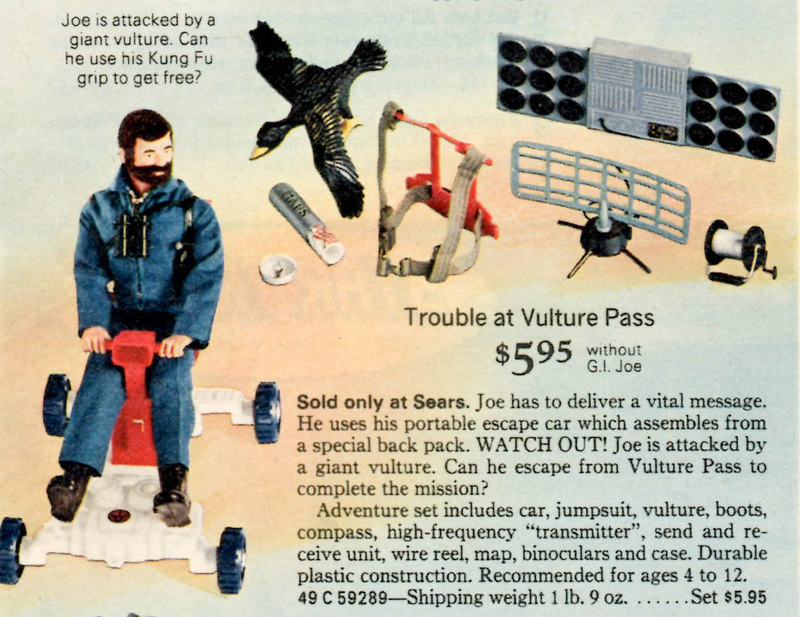 A Sears exclusive set for 1975 (7432.16, Sears number 49-59308) repackaged the Solar Communicator, the Escape Car, and reused the vulture that first showed up in Fate of the Troubleshooter. Also included are a map and case, black wire roll, compass, binoculars, and a royal blue jumpsuit similar to the one from Copter Rescue. 1975 was apparently a big year for the scavenging bird, as Hasbro also released Attack at Vulture Falls. Below, an image of the tough to find box courtesy of a private collection. Below, the advertisement in the Sears catalog. Note the yellow painted details on the vulture that don't show up on the production set.